Over the last seven years, as we have grown to well over 4000 members in our various services, I am often asked to opine about various financial books. Clearly, I am unable to read all of the ones being asked of me, but when enough of the members I trust suggest a certain book, I will usually take it with me on vacation. I just came back from a little over a week-long vacation, and was able to spend some time with family in Florida, as well as on the cruise ship The Disney Magic. (In fact, I highly recommend the Disney cruises to anyone with children, as their children’s activities are second to none). So, when sitting on my veranda, I was enjoying catching up on some of my reading. And, among the books I read was one entitled “Fed Up,” by Mrs. Danielle DiMartino Booth, as suggested to me by a number of my members. Most readers believe that the Fed or the government rescued the world from financial collapse in 2008/09. I would imagine that is why Ben Bernanke was chosen as Time’s Person of the Year for 2009. However, the facts suggest something quite different. For those of you whom have followed my writings through the years, you know I am not a big fan of the Fed. Moreover, you also would know that I do not believe they are anywhere near as omnipotent as most in the market believe. Recently, I presented my thesis to members, along with supporting episodes in history. For anyone who is willing to view the data in an honest way, it is rather clear that central banks do not control markets to the extent that so many believe. 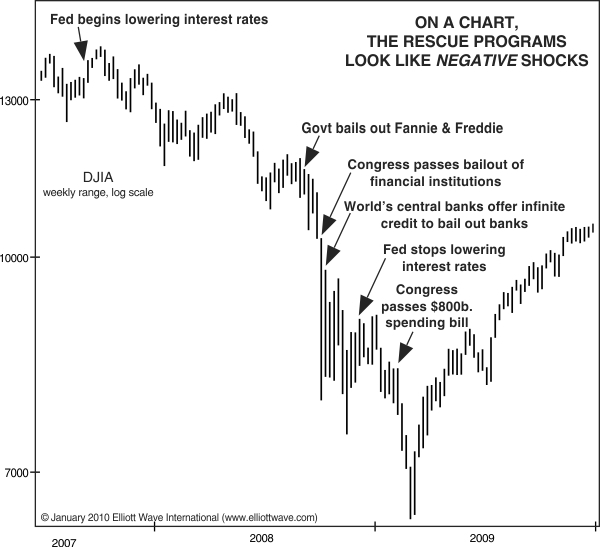 And, as this chart shows, during the financial debacle of 2008, the government and the Fed (collectively viewed by many as the Plunge Protection Team) were throwing one program after another to prevent financial collapse. Yet, they were unsuccessful in preventing the collapse, as the market lost almost 60% of its value within a year and a half between the end of 2007 and early 2009. So, it does not seem as though there was much “protection” being offered during this plunge despite all the programs and money being thrown at it. And, the Fed proved itself being unable to stem the tide of negative investor sentiment which took the market down. Yet, most believe the Fed is so much smarter today. Well, I hope you are sitting down when you read the rest of this article. In “Fed Up,” Ms. Booth provided deeper insight into what I have suspected for so long, as the ineptitude of the Fed seems to run even deeper than I had initially suspected. Not only does Ms. Booth point out how the Fed was powerless to stop the collapse, she outlines how the Fed did not even see it coming. And, she even uses what the Fed-heads themselves have said to prove her point. For years, I have noted how fundamental analysis is unable to identify a major market change before it happens. And, I have provided reasons for my perspective in this article, as well as many others. “Since Fed economists rely on seasonally adjusted data, their conclusions always trail well behind rapidly unfolding events.” Page 73. And, amazingly, several years later Ms. Yellen proved that the lessons of 2007-2009 have been forgotten when she proclaimed that the banking system is "very much stronger" due to Fed supervision and higher capital levels. Yellen also predicted that because of the measures the Fed has taken, another financial crisis is unlikely "in our lifetime." Ms. Booth was 100% correct in her assessment that Chairmen Yellen had not learned her lesson. And, I am quite certain that this statement by Yellen will come back to haunt her in the future, as I have explained in a prior article. “Neither Yellen nor Dudley had a strong argument for the likely benefit of QE. Though it seemed purchases of mortgage bonds was helping, the rationale for buying Treasury securities was sketchier. . . ‘We don’t know exactly how much a Treasury purchase program would do, but if we start one, we’ll be able to answer that question,’ Dudley said in March 2009. So, throw all the spaghetti on the wall, and see what will stick. . . The Fed’s lack of clear direction distressed Lacker. ‘This last discussion has been fascinating against the backdrop of our not having a clear sense of exactly why and how expanding our balance sheet affects the world,’ Lacker said. ‘I think we’re really groping in the dark here. I think we need to recognize that.’” Page 174. Yet, Time magazine presented Mr. Bernanke and the Fed as saving the world. Talk about propaganda. And, the world bought it hook, line, and sinker. And, I am quite certain that the great majority of those reading this article did as well. While Ms. Booth seems to be on the right track regarding her understanding of the cause of the 2007-09 financial collapse, I am not sure she went far enough in her assessment. You see, animal spirits control the market all the time. They are not released or contained. And, to believe otherwise is no less hubris than what you have just read from Janet Yellen. In fact, even Alan Greenspan, another former Fed Chairman, noted in front of the Joint Economic Committee that markets are driven by "human psychology" and "waves of optimism and pessimism." Ultimately, as Greenspan correctly recognized, it is social mood and sentiment – or “animal spirits” as some term it - that move markets. For those of you that have followed my work over the years, you will likely recognize this monthly chart which has kept us on the correct side of the major moves in the market for many years. And, as you can readily see fro the chart attached below, I am expecting the market to be setting up the next major crisis in a few years from now. Unfortunately, when the next major crisis likely strikes our financial markets in the 2020’s, many will be looking to the Fed/Plunge Protection Team to save the day. You see, the market has now trained investors to believe in the famous Fed “put,” and believe that the Fed has the power and expertise to save the market every time. However, it will likely be this next crisis which will open investor’s eyes to the fact that the emperor is not wearing any clothes. By then, it will be too late for most. So, we owe a debt of gratitude to Ms. Booth for enlightening those willing to see before it is too late.